I admit that I am not the world’s best food writer or photographer. Maybe I will get a little better over time, or maybe not. I won’t spend too much time or energy fretting about it. I mostly started this blog odyssey just for my self and my own sanity. I have so many cookbooks and so many recipes bookmarked on the internet (hello!! my epicurious.com recipe box has close to 800 recipes in it) that I would lose track of where my favorite recipes were from and what recipes I had already tried. It also gives me a way to link friends to the recipes I’ve made and my thoughts on the books I read. I have a Crock Pot that I got as a wedding or shower gift from my mother. I like to break it out every few months to cook dinner on the weekend. My commute to work and working schedule being what it is, slow cooker meals aren’t really something I can do on weekdays…since I am away from the house for too long. So…weekends it is. 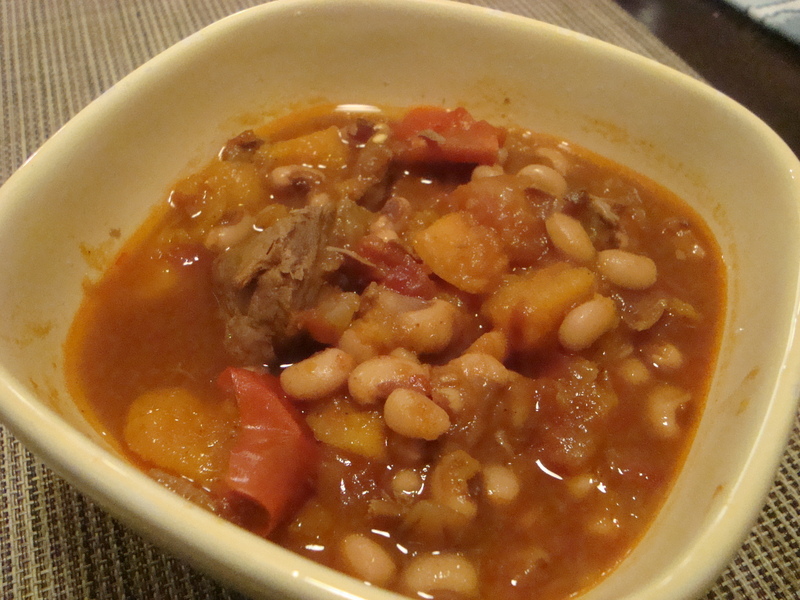 This Caribbean Beef Stew has an interesting combination of flavors and is loaded with great color and texture. Trim visible fat off beef, then dice the meat into 2 inch pieces. Heat a large heavy pan without adding any oil. Add the meat and cook, stirring constantly for a few minutes until browned all over. Stir in the pumpkin, onion, and bell pepper and cook for 1 minute, then add the paprika, cayenne, broth, and tomatoes. Bring to a boil. 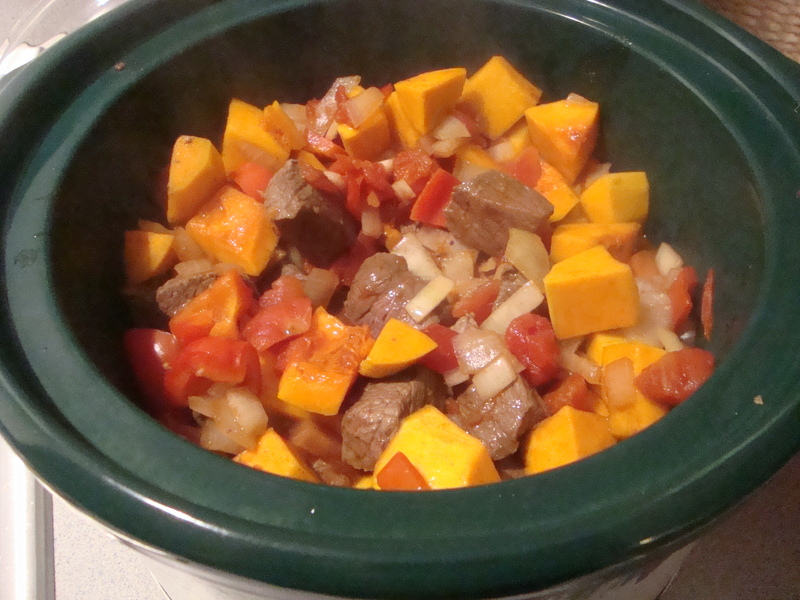 Transfer the mixture to the slow cooker, cover, and cook on low for 7 hours. 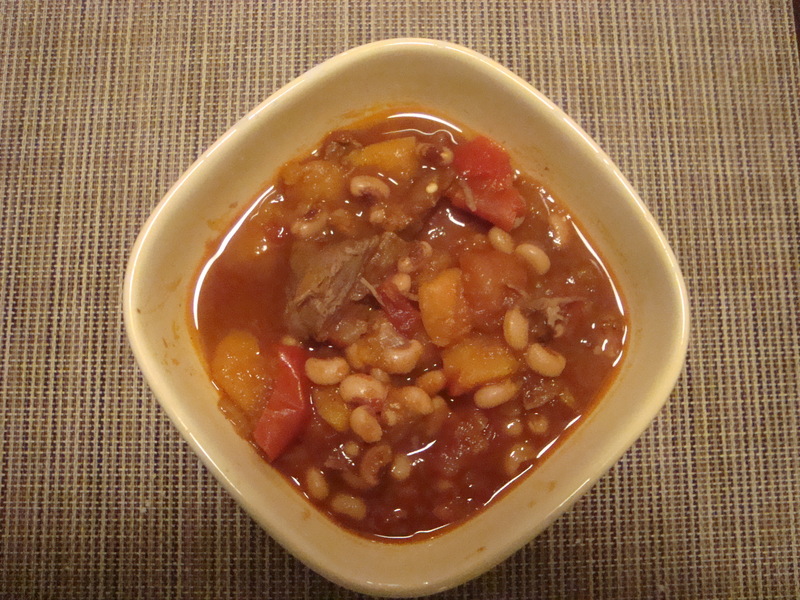 Add the pigeon peas and black-eyed peas to the stew and season to taste with salt and pepper. Re-cover and cook on high for 30 minutes. I’ve recently returned from a trip to Anguilla and St. Martin. The other day when it was really cold and blustery here in Massachusetts, I longed to be back in the sunshine of the Caribbean. The closest I could come was to cook up a Caribbean influenced dish for dinner. I found this one for Rice & black eyed peas with turkey kielbasa in the premiere issue of Food Network Magazine. It was easy to make and thanks to the brown rice and collard greens, relatively healthy. I found the end results to be full of Caribbean spice and flavor. Now, where’s my rum punch??? Meanwhile, heat the olive oil in a large, deep skillet over medium heat. Add the kielbasa and cook until golden, about 2 minutes. Add the scallion whites, celery, garlic, jalapeno, jerk seasoning and a generous pinch of salt. Cook until the vegetables are brown, about 5 minutes. Add the thyme and tomato paste and cook, stirring occasionally, until the tomato paste turns brick red, about 2 more minutes. Add the rice, bay leaves and the black-eyed peas with their liquid to the skillet and bring to a boil; do not stir. Add the greens; cover, reduce the heat to low and simmer undisturbed until most of the liquid is absorbed about 50-60 minutes; set aside for 10 minutes. Remove and discard the bay leaves. The Geraud of Geraud’s Patisserie is Geraud Lavest, who was born in France, worked all over the world, and moved to Anguilla in 2004. He worked as the pastry chef at Koal Keel for several yers before he opened his own bakery on the island. The patisserie is easy to spot as you drive along the main road in Anguilla, it’s green exterior are a bright, welcoming beacon. The interior of the bakery is just as bright, welcoming and charming. There are several tables inside and a few more outside. Geraud’s serves up breakfast and lunch with baked goods and special entrees. Their prices are very reasonable for Anguilla. We didn’t have a full meal there but we did stop in one afternoon to pick up a few pastries to snack on. We got a palmier and a mini blueberry cheesecake, which was about the size of a cupcake. The palmier was lightly sweet and crunchy. It was perfect compliment to a cup of coffee. The cheesecake was topped with pool of blueberry compote and was sweet, rich and indulgent. rating: 4 out 5 mangoes! The word veya means “ray of sun” in the Carib language. Veya bills themselves as serving the “Cuisine of the Sun”. Veya’s focus is on serving food that is inspired by the food you find around equatorial regions of the world. This includes the Caribbean, Morocco, and India. Veya is located on the road to Sandy Ground and is about 1/2 a mile a so on the right from the rotary off of the main road. We were able to find it with no trouble at all. We stopped in for dinner late one evening after having a couple of drinks at Elvis’s Beach Bar. The vibe of Veya is what I will call posh tree-house chic. Veya’s dining room is up a set of stairs and the center of the space is the bar area pictured above. All of the dinner tables are along the outside of the restaurant that wraps around the bar. The dining area is surrounded by open windows with flowing white curtains framing ocean views. The ceilings are all dark wood with the beams exposed. The climb up the stairs, all the dark wood and open windows are what gave me the feeling that I was in a tree-house. It was very elegant and contemporary. My husband ordered an appetizer of Velvety Yellow Split Pea Soup ($11). This soup was flavored with coconut, lime, and Indian spices. It was reminiscent of Mulligatawny soup by much smoother and richer in both texture and flavor. Our meal was off to a great start. Of course I stole a few spoonfuls of soup from him. I just couldn’t help myself since he was raving about it so much. The mister said to me “find out a recipe to make a soup like this at home!”. We frequently make dal (Indian stewed lentils) and lentil soup in our house and therefor have a cabinet full of canisters of dried lentils, split peas, and beans. So, I just may try to recreate this soup in my own home someday soon. For his main course, my husband order the Tamarind Glazed Roast Chicken with Christophene Gratin and tropical fruit chutney ($28). Chicken is not something that either of usually orders in a restaurant, but I guess he was drawn in by the allure of the tamarind glaze. Tamarind is another flavor that we frequently use in our home cooking. Veya’s roast chicken was juicy and loaded with tamarind flavor. MrMango love it and I loved that his tropical fruit chutney was comprised largely of mangoes! I ordered the sauteed red snapper with green papaya , mint and avocado ($34). I ate a lot of fish, particularly snapper, on this trip and this was one of my favorite fish dishes on Anguilla. It was light and fresh and I loved the touch of the avocado to add a different texture to the plate. We were both too full for dessert, although they did have some tempting options like coconut cake and tropical creme brulee. We were satisfied with our dinner and my husband declared it a better value for the money than Blanchard’s. Veya is open for dinner only and is closed on Sundays. Their cafe on the ground floor is open for breakfast and lunch. I still can’t seem to find Anguillan road names! Anyhow… this small bakery is on the main road on the south east side of the island. We randomly stopped in at Sweet Tooth bakery since we were parched and a bit peckish. it was early afternoon and there were no other customers and only one woman working inside. The bakery case was kind of empty with only a few options remaining including chicken pies, salt fish pies, and beef pies. Mr. Mango and I decided to share a chicken pie. It was one of our least expensive meals/snacks on Anguilla, coming in at a dollar and change. This little pie was meant to be eaten with your hands. It was very similar in size and shape to a Jamaican Patty. The flakey crust was wrapped around shredded, mildly spiced chicken. It was the perfect mid-afternoon snack for the two of us to share as we drove around exploring Anguilla.